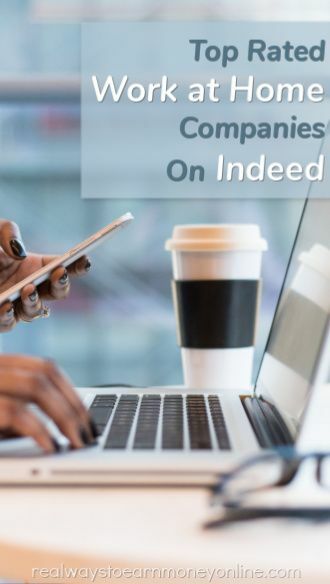 Today, we are talking about which work at home companies are rated highest on Indeed. If you weren't already aware, Indeed is a website that catalogs all sorts of useful info about businesses, especially facts that would be useful to prospective employees. For example, you can use Indeed to look up statistics about average salaries, check current job openings, or read reviews from former employees. Because of the vast amount of data available, Indeed is one of the first places you'll want to check when you're researching a company before applying for a job. They track companies of all sizes, including big names like Amazon, and tons of small firms you've probably never heard of before. If you're interested in getting into the work at home sphere, reviews are especially important because some companies don't treat their remote employees as well as they do those who work on-site. To make sure you don't get stuck in a bad situation, you'll definitely want to take advantage of every information resource you can find, but if you don't even know where to begin, all that research can take a lot of time. With that in mind, we've scoured the Indeed database and put together this list of highly rated work at home job opportunities. In the interest of variety, we tried to make sure there were several jobs on the list from all the more popular remote work categories, so a few excellent companies may not have made the list simply because their category was already over-represented. This is not an exhaustive list by any measure (or in any particular order), but it should be enough to give you some good ideas about how to begin your job search. I'm pretty sure everyone on planet earth has heard of Apple, but not everyone knows they hire quite a few remote workers. There are several home-based positions available at Apple, but the one with the biggest recruitment push right now is their “At Home Adviser” role: a phone-based customer service job. The average pay for that position is about $15 per hour, but some people make more than $20 per hour. Go here to apply for work at home jobs at Apple or read our Apple review. This company hires licensed mental health professionals to help people via video or text chat. The pay is pretty high by work at home standards (in the $20 per hour range, roughly) but when you consider the educational requirements, it doesn't sound so great anymore. Still, the reviews are extremely positive, much better than average compared to most other phone jobs, so Ginger.io must be doing something very right. Go here to apply for jobs at Ginger.io or read our Ginger.io jobs review first. This is a reputable English Language tutoring site where teachers can set their work rates. The reviews for this company on Indeed are almost all very enthusiastic. Italki get especially high scores in areas like Work-life balance and culture. A lot of the comments mention schedule flexibility as a big perk. Go here to apply at Italki or read our Italki review first. Another English Language tutoring company with a very good reputation, and decent pay ($14 – $22 per hour). The score is not quite as high as some of the other opportunities on this list, but they have more than 300 reviews on Indeed, so quite a few people have taken the time to express their opinions, and most of them seem to value the job pretty highly. This is a virtual call-center job from a well known company. The average pay is $27k per year, which works out to approximately $13.50 per hour over the course of a full 40 hour work week. Obviously that isn't amazing, but it's still well above average compared to many other work-at-home phone positions, some of which pay considerably less than $10 per hour. Go here to apply for work at home jobs at Capital One or read our Capital One review first. Earn between $10 and $18 hourly working as a social media moderator for this company, one of the highest rated on Indeed for this particular niche. The hours are flexible and the work is apparently relatively easy to do. They generally prefer to hire people fluent in more than one language. Go here to apply at ICUC or read our ICUC review. This company hires virtual assistants on a contract basis. The pay rate is not disclosed, but the hours are very flexible, and the high rating on Indeed suggests most aspects of the job are probably pretty excellent. Go here to apply at Belay Solutions or read our Belay Solutions review. Earn between $10 and $25 per hour (depending on how fast you are) working for one of the highest rated transcription companies out there. You'll be an independent contractor, so you set your own schedule and work at your own pace. Go here to apply at 3Play Media or read our 3Play Media review. This is one of the oldest and best established writing content mills on the net, and they have a higher rating than any other major writing gig I could find on Indeed. The pay, which varies depending on your skill-rating, isn't great, but Textbroker are quick to give new writers a chance, and it's still one of the best places to learn the ropes of the freelance content biz. The reason for the high Indeed rating is pretty simple. A ton of content writers out there have worked for Textbroker at some point along the way, and most of them did so at an early time in their careers, when they were still trying to figure out the basics. A few months working for Textbroker will give you a good grounding in the fundamental skills needed to excel as a freelance writer, and you'll be able to carry that knowledge with you as you advance to higher paying gigs. Go here to apply at Textbroker or read our Textbroker review first. This is a research job where you do short write-ups based on user questions. The work is supposed to be relatively easy, and the scheduling is extremely flexible. If you're really, really fast you can apparently make as much as $2000 a month. Go here to apply at Wonder or read our Wonder review first. We hope the list above helped you find some interesting jobs you hadn't already heard of before. Obviously, these aren't the only companies out there with good reputations among remote workers, but if you're new to the work at home scene, these should be an excellent starting point. Finding good, dependable remote career opportunities isn't always easy, but sites like Indeed can help you cut through some of the misinformation out there, and focus on jobs that will really pay off in the long run. We also have a list of highly-rated work at home companies on Glassdoor if you'd like more ideas. Do you have past experience with any of the companies on this list? If so, we'd love to hear your opinions. Give us a quick shout in the comments section below, and tell us what you think.